Meningococcal disease is a condition that most parents in the United States have become familiar with in recent times. Immunization against this disease is sometimes mandatory in settings where children and adolescents will be living in close proximity for an extended period of time, like at summer camp or in dormitories. Since meningococcal disease can become life-threatening in a short period of time, the vaccine to prevent the disease is the best option. Meningococcal disease is an infectious condition caused by Neisseria meningitidis, also known as meningococcus bacteria. It is probably best known for causing an infection of the lining around the brain (meninges) which is referred to as meningitis. However, the bacteria can also cause pneumonia (lung infection) and sepsis (blood infection). The latter allows the bacteria to spread throughout the body and damage various organs. The disease is life-threatening with a mortality rate as high as 20%. Almost 1,000 Americans contract the disease every year and it affects over 300,000 annually in developing nations. With the ease of global travel these days, travelers are also at risk. However, not every person who is exposed to the bacteria will develop an infection. In fact, the bacteria is commonly found in the mucosal membrane of the nose and throat in up to 10% of the general population despite them not having any symptoms. These asymptomatic individuals are known as carriers and could spread the bacteria to others. 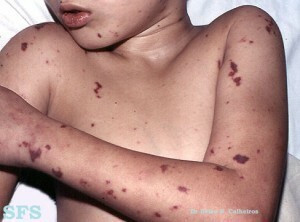 The cause of meningococcal disease is the bacterium Neisseria meningtidis. There are different strains of this bacterium which may be prevalent in different parts of the world. Although there are some 13 known serogroups of this bacteria, the most important ones that cause disease in humans are A, B, C, Y and W. According to the CDC, the three serogroups (strains) that cause human disease in America are B, C and Y. Transmission of Neisseria meningtidis is primarily through respiratory droplet spread. This means that the bacteria is spread through the secretions from the nose, throat and other air passages. It is spread by direct contact with these secretions and is therefore easily transmitted among people living in close quarters or through actions such as kissing. However, it is not as contagious as the common cold or flu. Many people think that the meningococcus bacterium only causes meningitis, which is inflammation of the lining of the brain and spinal cord. This is untrue. While meningitis is one of the common consequences of infection with Neisseria meningtidis it can also affect other parts of the body. Most of the time it results in septicemia or a combination of meningitis and septicemia. The bacteria can also damage tiny blood vessels and cause it to become leaky. As a result blood may seep out of the circulation and into tissue spaces. It can lead to a host of cardiovascular complications. Meningococcal infection may also cause respiratory infections like pneumonia (lungs) and even infect the paranasal sinuses (sinusitis) or middle ear (otitis media). Furthermore septicemia can result in infection of the joints, eye and heart lining (pericardium). There are three layers of tissue surrounding the brain and spinal cord known as the meninges. When it is inflamed, the condition is known as meningitis. Most cases of meningitis are due to infections. Meningococcal meningitis occurs when the bacteria travels through the bloodstream and reaches the meninges. It multiplies in the CSF where it can thrive as the tight blood-brain barrier holds back the immune cells from attacking the bacteria. The entry, dissemination and multiplication of the menignococcus bacteria in the bloodstream is known as meningococcal septicemia or meningococcemia. The bacteria are able to evade some of the immune cells due to its cell wall. It is a very dangerous type of meningococcal disease as the bacteria damages blood vessel walls and affects a host of different organs in the body. It can result in septic shock and if prompt treatment is not initiated, the outcome is often death. Antibiotics are the main drug used to treat meningococcal disease. It is administered intramuscularly or intravenously. Inotropic agents are used for patients in shock. Diuretics are administered to reduce the intracranial pressure (ICP). Corticosteroids to reduce inflammation and suppress immune activity which may be harming the body. The best preventative measure is taking the appropriate vaccine which provides protection against the bacteria. There are vaccines for the different strains but until recently this only included the A,C, Y and W-135 strains. However, the FDA approved a new vaccine against serogroup B. The vaccines do not contain live bacteria and cannot cause meningococcal disease in a person who is being immunized. Antibiotics are sometimes used a means to prevent the disease in a person who is known to be exposed to the bacteria. This is then referred to as prophylaxis. It should not be used as a means of replacing the vaccine as a person may not know when they come in contact with a person with meningococcal disease or a carrier. The vaccine is therefore the preferred option for prevention and a second dose should be taken 6 months after the first dose for maximum protection.